Understanding how to sell to teens has become a highly competitive industry all its own. If companies can get in on a trend or subculture while it is still hidden, they can be the first to bring it to market. So cool hunters"--those who can track down the latest cool trends in teen life--can make a lot of money marketing their expertise to companies marketing to teens. Information on what is "cool" can be used to create products that will reflect back exactly what the kids will want. Among the best in the field at "cool hunting" are Dee Dee Gordon and her firm Look-Look. For a large fee, Look-Look customers get real-time interactive focus group testing with real kids, market demographic studies, and the promise of knowing about teen trends faster than anyone else. 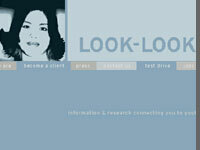 Look-Look claims over 10,000+ Internet linked, ahead-of-the-curve, youth correspondents who send digital photos, and comment via email on what, and who, is cool in their lives. In the early 1990s, Sprite was an also-ran brand in the competitive soft-drink category. But after teen focus groups to figure out what was wrong, Sprite launched a teen-targeted ad campaign which poked fun at marketing itself. For awhile, it worked. But then focus groups showed kids were getting wise to Sprite's anti-marketing campaign. So Sprite cloaked themselves in genuine cool--hip-hop--and it became Sprite's vehicle to get to teens and talk to them in a credible way. Sprite did it by developing relationships with artists, paying to sponsor hip-hop concerts and MTV events, and bringing money into MTV, and Sprite into the very heart of teen culture. In a way, they almost weren't even selling the product. They were selling the fact that they understood the culture. Sprite became an icon of sorts--it's not just associated with hip hop. It's a part of it. As much as baggy jeans and sneakers. This New York marketing firm's specialty is under-the- radar marketing. For example: Cornerstone hires kids to log into chat rooms and pose as just another fan of one of their clients. Or, they recruit incoming freshmen to throw parties, where they subtly pass out promotional material to their classmates. Cornerstone helped Sprite tap a network of radio DJs and hip-hop artists to smuggle their message into the world of kids. And it worked. 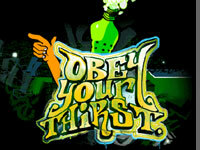 Sprite is the fastest-growing soft drink in the world.. 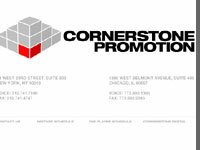 Cornerstone's client list also includes Nike, Fox Interactive, and Sega. Viacom is one of the five media giants responsible for selling nearly all of youth culture. They're the true merchants of cool:. Viacom owns media outlets CBS, MTV, VH1, Comedy Central, Black Entertainment Television (BET), United Paramount Network (UPN), Nickelodeon, Paramount film studios, Blockbuster video stores, and Simon & Schuster book publishing. It also owns most of the Infinity network of radio stations, and dozens of Internet properties. By owning this network of media divisions, a conglomerate like Viacom can relentlessly cross-promote and sell its products. Take, for example, Howard Stern. Viacom leverages him across their properties. He is syndicated on 50 of Viacom's Infinity radio stations. His weekly TV show is broadcast on Viacom's CBS. His number one best-selling autobiography was published by Viacom's Simon and Shuster, then released as a major motion picture by Viacom's Paramount Pictures-- grossing $40 million domestically and millions more on videos sold at Viacom's Blockbuster video. 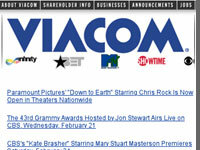 Viacom's web site is a portal to all its companies. Choose one and see what it offers the Viacom powerhouse. Owned by Viacom, MTV is a youth marketing empire. Launched 20 years ago, the cable channel employs a simple but brilliantly commercial concept--use record companies' promotional music videos as creative programming. However, in the late 1990s, MTV's ratings began to slide. So it embarked on a major research campaign to understand its teen audience better. The hallmark of the campaign was the "ethnography study" a way to get really close to teens lives. And it paid off. Today, the new MTV is all about learning what kids really want, then delivering it to them. Their signature show, "Total Request Live," plays music videos by popular demand. And every afternoon, mobs of kids crowd into Times Square to gaze up at the windows of the "TRL" studio, to see whichever mega band might be making a guest appearance. But while MTV executive Dave Sirulnick emphasizes TRL's democratic approach and how they take their cues from their teen audience, some media and music critics, such as The New York Times' Ann Powers, disagree.